Now that the festive period is now past and the wrestling schedule is now getting back into full flow, it's time to get Ready For The Weekend for the first time in 2016! 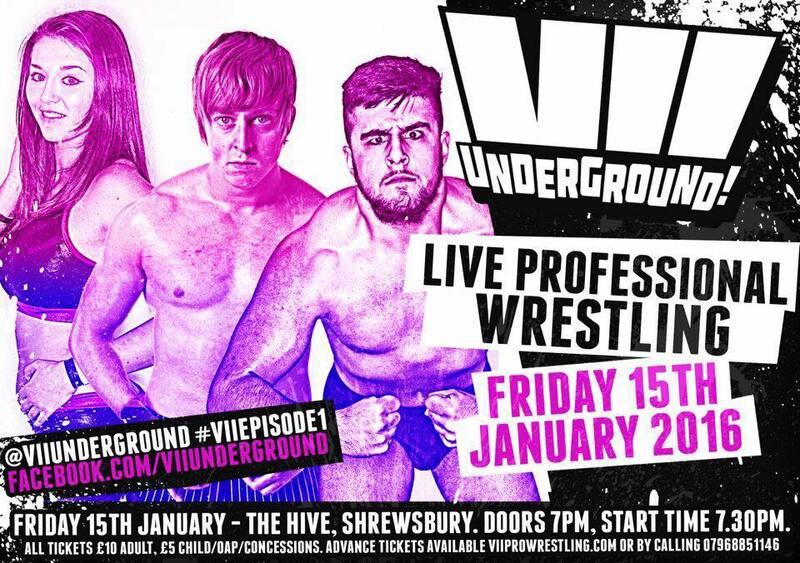 Friday night shall see VII Underground, formerly known as VII Pro Wrestling before joining together with Shropshire Wrestling Alliance who took the VII Pro Wrestling name for their own events, host their first event of 2016 at The Hive in Shrewsbury. The event entitled 'Episode 1: Live Free Or Fly' has four matches currently scheduled to take place on January 15th. One match of particular interest is 'Flash' Morgan Webster vs Nixon Newell. 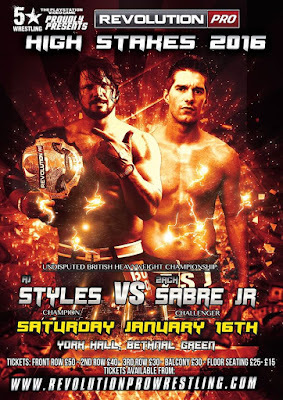 Both Webster and Newell proved in 2015 that they are set to continue their rise in British Wrestling with opportunities presenting themselves even further afield. 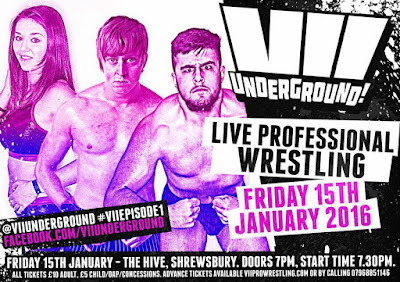 Both competitors have been stealing shows all over the UK and their match at VII Underground may well be another to add to the list. Originally VII Underground announced that Dan Moloney would be facing Ethan Silver this Friday. However, Mike Bird took exception to that as he felt their was unfinished business that had to be addressed after the Trifecta Trophy tournament. So, VII Underground obliged and have added 'Ginger Jesus' to the match to make it a triple threat contest. A match of competition just turned into a match filled with bad blood. Speaking of the Trifecta Trophy, the ending of the tournament was marred with controversy when Wild Boar got involved, knocking out Ryan Smile, allowing The Bruiserweights the win. Understandably, Ryan Smile is not happy and wants a measure of retribution against Wild Boar and VII Underground were happy to let these two men sort out their differences in the middle of the ring. has been a part of some of the best known promotions in the world such as PWG & NOAH. 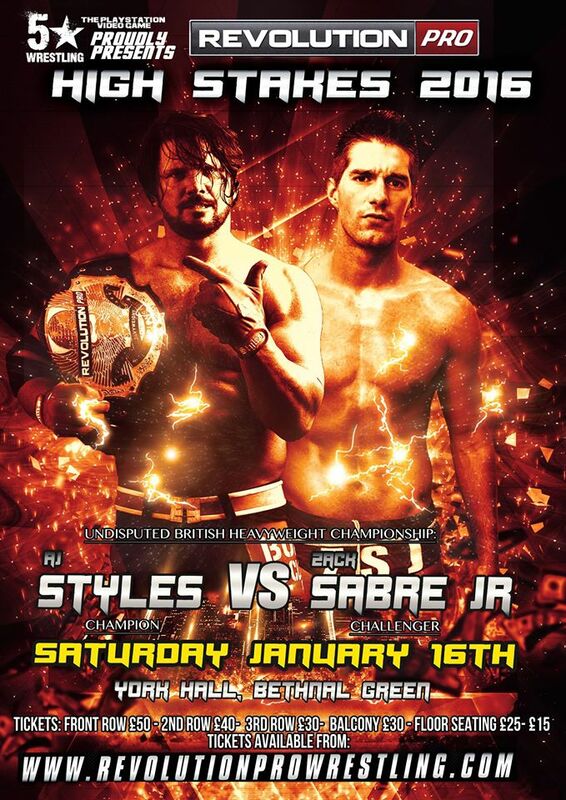 However, Zack is now back and he looks to become the man in Revolution Pro Wrestling by taking the Undisputed British Heavyweight Championship from a multi-time, multi-promotion world champion in the shape of AJ Styles. As we said before, this show will be an earlier contender for Show of 2016. This match may well be a contender for Match Of The Year as well. 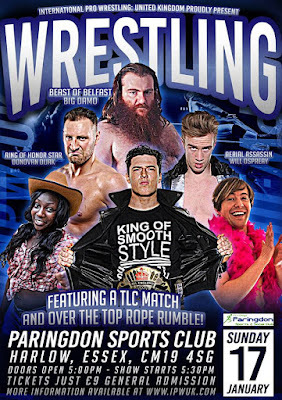 Finally rounding off the first full wrestling weekend of 2016 and IPW:UK are making their debut in Harlow, Essex in conjunction with WrestleForce. One match which will see IPW:UK and WrestleForce meet will see Nightshade meet the current IPW:UK Women's Champion, Tennessee Honey. Tennessee Honey as been one of the stars of the IPW:UK academy and likewise Nightshade has been making a name for herself in WrestleForce. This contest will be a great showcase of the best of both companies. One of the most successful teams in the history of IPW:UK will face one of WrestleForce's most popular team on Sunday as the Swords Of Essex compete against the Tassle Tusslers. While Peace & Brad O'Brien may well have the crowd behind them, Will Ospreay & Paul Robinson certainly will not after their change in attitude. Swords Of Essex have claimed that after breaking their backs for IPW:Uk, they are going to return the favour. The Tassle Tusslers will need to do all the can to make sure they are the first on the list. The main event on January 17th in Harlow will see DND defend their IPW:UK Tag Team Championship against former champions, The London Riots. Normally this would be a great match under standard rules. However, this time those rules will not apply as the championship will be up for grabs in a Tables, Ladders & Chairs contest. The London Riots are known for their violence but DND have not backed down from a single challenge put in front of them since becoming champions. This match will be no different. 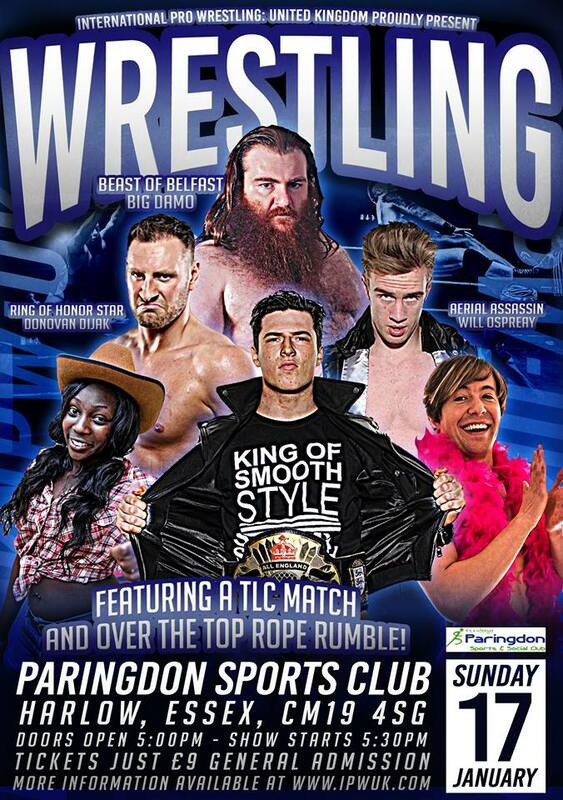 IPW:UK make be making their first trip to Harlow this Sunday but it promises to be a debut to remember.